Clearview Community Theatre is proud to present “We Have Come to Sing” a Musical Fundraising Concert and Raffle/Silent Auction. Shows are at the Clearview Community Church in Stayner on Friday April 5 and Saturday April 6 at 7:00pm. 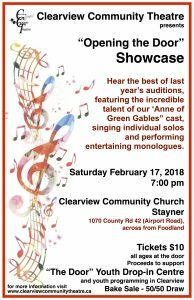 Featuring our Open Troupe singing Broadway hits as well as songs from “The Greatest Showman”, our Children’s Troupe performing a mini-musical called “Bremen Town Jam”, our Youth Troupe singing excerpts from “You’re a Good Man Charlie Brown” and our Ukulele Troupe playing favourites, old and new. Check out the details for our Travelling Troupes for 2019. You’ll find the page in the Menu. We are offering another winter theatre workshop series led by Rochelle Reynolds, an accomplished professional actor, writer and director. Rochelle holds two degrees in theatre and is eager to share some of her knowledge and experience with all of you! Check out the details on our Workshops page and e-mail to reserve your spot. Stay Tuned for tickets for our concert in April 2019!